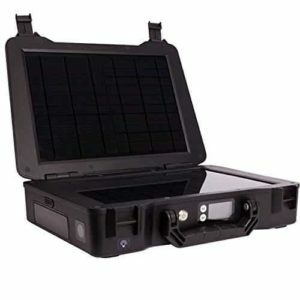 A lot of people think about portable solar generators as an emergency power source. For a regular household, such a generator might not be able to cope with the power consumption. They are small units and the amount of power they can provide is quite low. Their intended purpose is a bit different. Portable solar generators are commonly used for camping to power a single consumer or various sources of light. They are basically, solar powered UPS units. The power they provide is limited and were designed to be used in case of emergencies. A portable solar generator usually has two main components. It has a photovoltaic cell that converts light into energy and a battery that stores that energy. The capacity of the battery can vary. We picked 10 portable solar generators from all ranges and from all price categories. 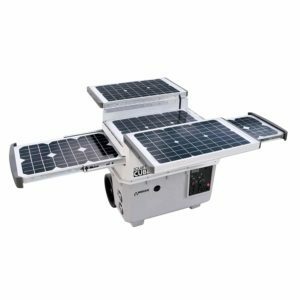 Here is our selection for the top 10 best portable solar generators in 2019. Nature PowerPak 40415 is a reliable and well designed solar power generator. 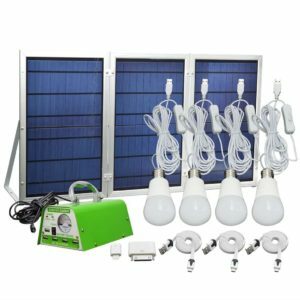 It comes as a complete kit that is capable of delivering a high output and store a decent amount of energy. The kit comes with a large battery with caster wheels for easy transportation and a handle. It can provide up to 1800 watts and features 6 120 volt outlets. The battery also has 2 USB ports and a digital display that shows all the relevant information. The solar cells can be folded and provide 1.5 watts that will recharge the battery when not in use. Everything can be compacted so that the entire kit will turn into a luggage style box. ACOPOWER portable solar charger is a great little companion for the ones that like to spend time out in the wilds. It was made to be very compact and easy to use. It comes in a small textile briefcase and the whole setup takes just a couple of minutes. The kit can convert 50 watts of power which is stored in a small battery unit included in the kit. As portability has been the most important aspect, the kit was made to be easy to carry around and setup in a matter of minutes. 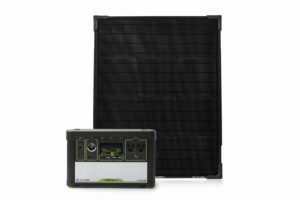 Goal Zero Yeti 400 is a great solution for the ones that do not afford to pay thousands of dollars on a solar power generator kit. It is a small little kit that includes a rechargeable battery and a small photovoltaic cell. The battery that comes with the kit can be charged in about 16 to 30 hours when outside or in just 5 hours from a wall plug. It also has a power inverted that ensures the battery can power even large energy consumers. The manufacturers offer the kit in several different setups and different capacities. It has an 18-month warranty and several protection systems. Overall the kit offers great value for money and it is quite compact making it even travel-friendly. The kit includes a 128 Wh lithium ion battery. The battery is charged by a foldable solar cell which can be connected to the supplied wires. Everything is made so that it is very easy to setup. In terms of practicality, the battery comes with a small handle and all the needed types of outlets including USB ports. The solar cell is foldable and also comes with handles. It is a portable. 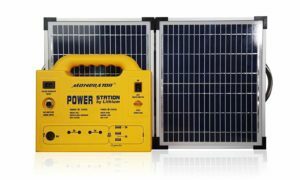 ACOPOWER solar power generator kit is an affordable option for the ones that need power on the go. It is a very lightweight kit and very simple to use. It comes with everything needed included and setting it up takes just a couple of minutes. 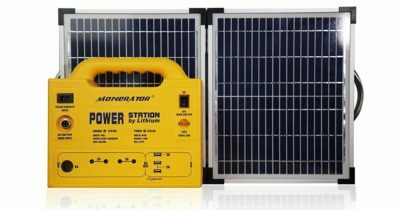 Unlike other portable solar power generators, this kit does not include a battery. It can supply power directly to external batteries or it can charge mobile devices using a USB cable that can be plugged into the small output box. The kit can be folded, making it as small as a suitcase. It has a durable construction that makes it weather-resistant. As for warranty, the manufacturers offer 12 months and have a refund policy. Wagan EL2546 Solar e Cube 1500 is close to being a professional grade portable solar power generator. It has a clever design that makes it possible to setup the generator in a couple of minutes without having to work with any wires. The generator has the solar cells built in. They just slide so that they can spread and get coverage. Beneath the solar panels, the unit has a large rechargeable battery. Charging the battery can take quite some time since it has a large capacity. According to the specifications, the unit has a 1500 watt inverter. It features 2 AC outlets and can power various portable devices using the 2 USB ports. 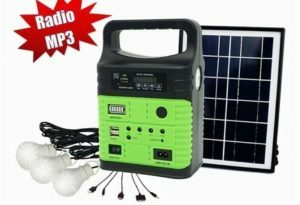 Wagner portable solar generator kit is by far the most inexpensive and practical product in our list. It is very compact and easy to setup. The kit comes with everything needed to power small devices. It even includes 3 light bulbs that can be powered directly from the battery. The battery uses high-quality cells with a lifetime of at least 1000 hours of usage. Charing the battery takes a good number of hours using the solar cell. The solar cell is small which makes it easy to travel with. Capacity is reasonable. The kit uses a 9Ah 3.7 volt battery and 6-watt solar panels. It features 2 USB ports, a charging level indicator, AC input and a built-in flashlight. The kit also includes all the required cables and accessories. 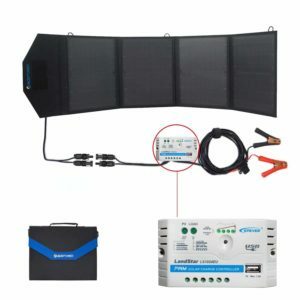 Renogy Phoenix portable solar generator kit has a rather interesting design. Basically, it looks like a briefcase, a heavy briefcase to be more accurate. That is because the solar cells are inside as well as the battery. The kit just opens and the panels are built-in. The battery is hidden inside. On the edge of the case, the unit has a small LCD display that shows the charge level. On the sides, it has several ports hidden to power different small electronics. For the price, the generator offers great value. Because of its shape and design, it is an ideal pick for campers and the ones that find themselves in the middle of nature without any power source. 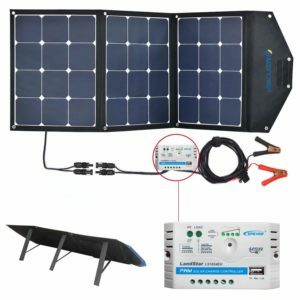 HKYH solar panel generator is one of the most versatile kits on our list. It basically comes with everything needed and a few extras. The kit includes several light bulbs along with the required cables. It is also quite inexpensive compared with other similar generators. 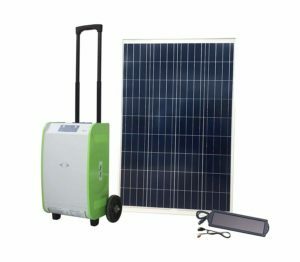 The kit comes with one foldable solar panel and a solar DC system. As far as the light bulbs go, they are reasonably bright and since they are LED, they take very little power to run. The battery cells do take some time to charge using the solar panel. As far as outputs go, the kit only has 5 USB ports. They can be used to power any type of device that uses a USB port. 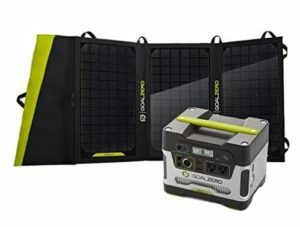 The Goal Zero Yeti solar generator kit is not as portable as some would like but it offers better capacity and faster recharging when compared to other similar products. It can provide 300 watts of continuous power. The solar panels used for the kit can generate 20 watts. It has a foldable design that makes the panel take very little storage space. Connecting it to the generator unit is straightforward and takes only a couple of seconds. Output options are enough. It comes with 2 USB ports, 2 AC outlets, and several 12-volt outputs. The unit also features a small LCD display that shows inputs, outputs, and battery charge level. Portable solar generators need to be easy to carry above anything else. Some manufacturers seem to have forgotten this aspect and make their units excessively heavy. When looking for solar power generators it is important to look at several specifications including their weight. To make it easier to decide which solar generator to buy, we listed the most important things to look for. These decisional factors are the same ones used to determine which portable solar generators were deemed worthy to be included in our list. Weight: As mentioned before, a portable solar generator needs to be portable. As most manufacturers do not mention how heavy to a unit is, the only way to get a vague idea is to guess by their size. Energy storage capacity: The general rule is that more energy storage capacity also means more battery cells and thus, the unit gets heavier. There is no ideal energy storage capacity size. Practicality: Since they have to be portable, the solar cells need to be foldable and the main generator unit needs to have a handle or some way to make it easy to carry and move around. Outputs: Not everyone needs access to a standard wall plug when camping. For this reason, it is a good idea to check what output ports the generator comes with. Portable solar generators need to be practical and they have to be capable of delivering power continuously. Usually, the solar panel will not be able to keep charging the battery cells at the rate they are depleted by a consumer. For this reason, whenever leaving home, it is important to first charge the generator before throwing it into the trunk. Our picks are mainly compact generators made to be easy to setup and just as easy to pack. Their pricing can vary quite a bit but it all depends on the needs of the person buying it and the available budget. The 10 products chosen for our list cover all price ranges and all types of needs.